Yes. All good (even great) things come to an end. And so be it. My 4 mths sublet in Stuyvesant Town or Stuy Town (just on the border of east village) comes to an end tonite. This has been the best 4 mths in the 5 yrs i have been in New York City. And that means a lot because i have stayed in several neighborhoods, year on year as my life as an urban gypsy, who moves from one sublet to another and always has a reason to go out and enjoy to the hilt. 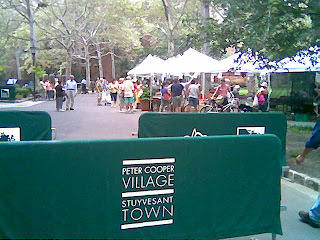 Stuy Town was special. Its one of the hidden gems of NYC. A large residential complex with large apartments, nice manicured walkways, tennis courts (can you imagine - tennis courts right outside my apartment building), own park with a fountain and a great community of young professional people and aging boomers! And then i had a great room-mate who has been a chef, actor and now a school teacher (lets call him M) who has been living in stuy town in the same apartment for 20 yrs now and taught me how to cook a Toad in a Hole. But what made the 4 mths special was the neighborhood - specifically the few blocks from 14th street to 4th street and av B and av C. There was the awesome local cafe , b cup in which i spent so many weekends just pondering, watching, and brainstorming with my friends. Then the many nights of mad partying at China 1 or the Sun Burnt Cow and then heading off to Muhammed Falafel Five Star for Lamb Gyro , or to get some corn bread and spinach at the Punjabi Deli. I will miss these 4 mths. Not to say i am going to move far from where i am - i may still find a sublet in east village - but stuy town was special - everything just was great. And that will not be the same again. Of course, i sublet because i move on and usually find more interesting and exciting places. The night also coincides with Obama's Historic Speech for Change at the DNC. Yes, time for a change and to move on. But as one does that you take these beautiful memories along to keep you moving on and on and on.